The short period between games in the two-legged World Cup qualifier between Australia and Honduras has been criticised by the latter's coach, Jorge Luis Pinto. The two matches of the play-off tie are only five days apart. With no direct flights between Honduras and Australia, both teams face journeys of about 24 hours. "It's inhumane of Fifa to put the dates so close with such a long trip in between them," said Pinto. The Honduran team will fly from San Pedro Sula to Los Angeles' LAX airport, which will take nearly seven hours. They will then fly to Sydney, which will take nearly 15. Including transfer time, the entire journey will take approximately 24 hours and cover 10,866 miles. However, Pinto suggested Honduras may be at an advantage playing the first leg at home. "We don't have to do two trips that could be harmful to us," he said. "Australia have to come here and play the game and then go home, and that's more tiring." 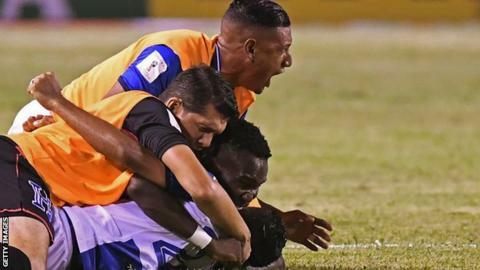 Honduras reached the play-offs for the 2018 World Cup having finished fourth in the Concacaf standings, while Australia beat Syria over two legs to progress from the Asia section. The winner of the two-legged play-off will advance to the World Cup finals in Russia next summer.